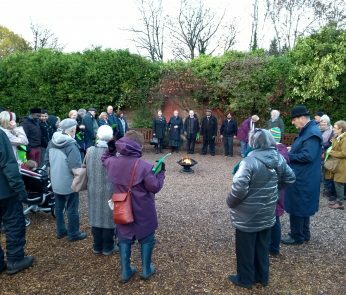 During Scottish Interfaith Week, the Greenock and Paisley Presbytery of the Church of Scotland met at Cornerstone in Bishopton. 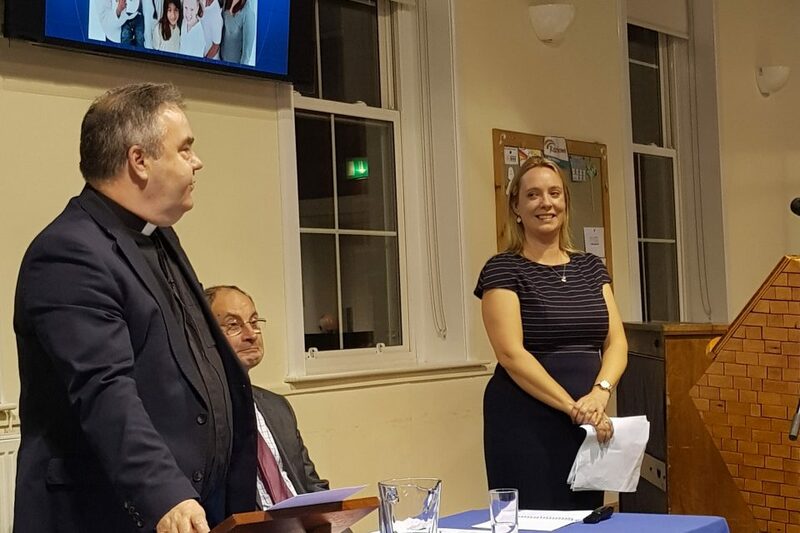 Their guest speaker for the evening was Frances Hume, Senior Development Officer at Interfaith Scotland and I was delighted to be invited along as a Scottish Interfaith Week ambassador. The Presbyteries consist of all the ministers in the district and some elders, diaconate (a form of ordained ministry) or committee representatives too and sometimes employs full time staff. I have often wondered what a Presbytery meeting might be like. The highest court of the Church of Scotland is the General Assembly formed of the representatives of the Presbyteries. I would really love to see that in action too! The Presbytery meeting is like a court where all voices have a right to be heard and have to be respected, and each voice should be equally weighted. Great in theory but it can be difficult in practice! The Greenock and Paisley Presbytery moderator is newly appointed Dr. Peter McEnhill, a former Professor of theology from Cambridge University, and an outstanding preacher. It was great to hear him in action. I couldn’t help thinking that steering the Presbytery justly through all its issues and all its opinions must have been an enormously challenging task. Armed with a great sense of humour and mission Dr McEnhill skilfully steered the meeting and I was impressed by the impassioned debate and sense of justice. Dr McEnhill talked about the difficult problems of the early Church and the firmness of conviction and commitment required to tackle these. He used the Leonard Cohen song ‘Anthem’ as an illustration. The song says that there are “cracks in everything and that is how the light gets in”. Cohen’s song tells us that it is important to recognise our imperfections but keep making a noise about faith. For the Church the narrative revolves around the brokenness of Jesus on the cross. It is through our brokenness we are open to healing light said Dr McEnhill. Next up was the guest speaker for the evening, Frances Hume. 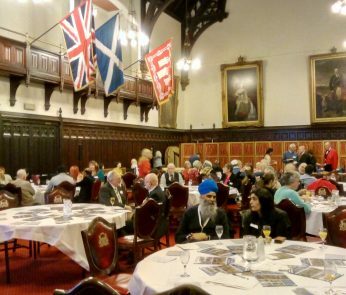 Frances and I had travelled to Barcelona together for Interfaith Scotland amongst other adventures and I was looking forward to hearing my friend’s presentation which was entitled “Interfaith Encounter”. What does this mean? Frances summarised this as people of different faiths and beliefs meeting together and an opportunity to learn about each other’s doctrines and stories. It is about forming friendships and working together for the common good. It is also a means of enriching and strengthening our faiths through encounter with others. She also talked about what interfaith encounter is NOT – it is not a means to convert others to your faith, or diluting your faith or creating a new syncretistic “interfaith religion”. Frances addressed the Christian scriptural imperative for interfaith dialogue looking at various Bible verses like Genesis 1:27, “God created man in his own image”, Hebrews 13:2 “Be not forgetful to entertain strangers: for thereby some have entertained angels unawares” and Matthew 5:9 “Blessed are the peacemakers, for they will be called children of God.” Frances continued to point out that for Christians, our faith is already based on Judaism and a Jewish Rabbi Jesus, so from the start we have a strong interfaith element. She also talked about the Bible story in which Jesus praises the great faith of the Centurion, although he was Roman and not Jewish, in Luke 7:1-10. 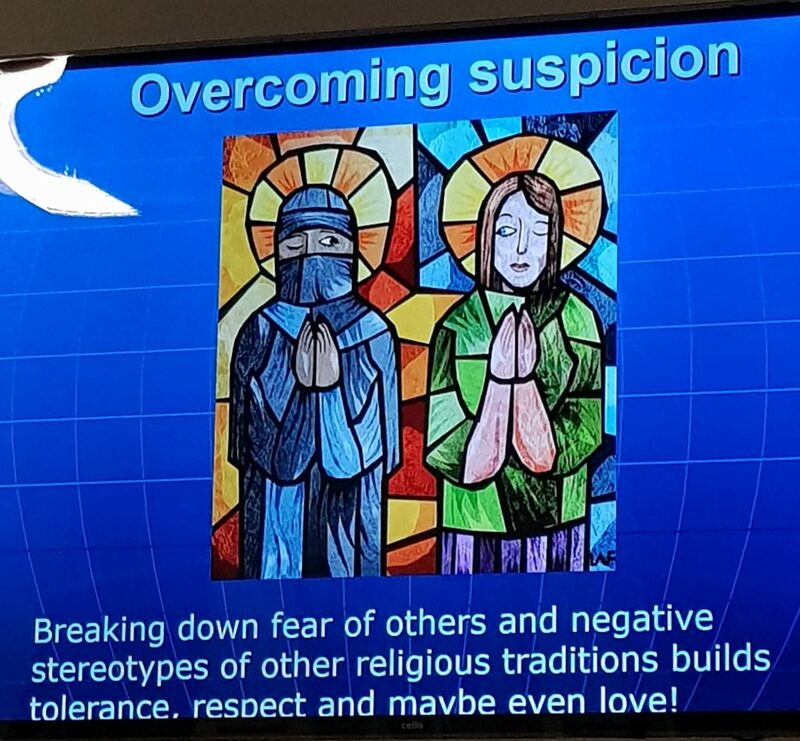 She spoke of the greater understanding, trust and respect learning about other faiths brings; how it helps with responding to challenging world events, how religious rights and inclusion help tackle social issues, and help with conflict resolution. 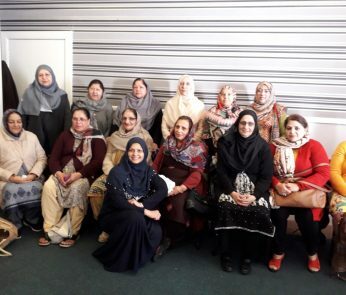 She talked about the fun of sharing faith journeys, visiting each-other’s places of worship, informal chats, scriptural reasoning and social action projects. After Frances’ talk, Dr McEnhill talked of an occasion at Cambridge when a meeting was arranged between interfaith religious leaders and the Archbishop of Canterbury. The organisers were very pleased with themselves at this ‘coup’ of getting the religious leaders together around the table. This was cut short when they realised the leaders were already good friends who had met often! The former Archbishop of Canterbury Rowan Williams knows how important this is. He says, “A growing awareness that peace throughout the world is deeply entwined with the ability of all people of faith everywhere to live in peace, justice, mutual respect and love.” These same fundamentals that are vital for interfaith exchanges, are vital also for the minutiae of Presbytery business (peace, justice, mutual respect and love) and were also the same challenges to our saints of long ago. We missed the end of the Presbytery meeting which after three hours of business had over run with still a sense of much unfinished business. Interfaith week is a busy week and tomorrow held another full day. What a privilege to see all that passion in action at the Presbytery meeting and the skills required for navigating choppy waters. Thank you Greenock and Paisley Presbytery.